Whenever I travel to Michigan, I always love to stop by Munro’s in Berkeley and see what they have in stock. Sometimes my visit coincides with one of their sales. This time I hit the jackpot with a sale on all their freshwater pearls (25% off) and Chinese crystal (50% off!). I also love their extensive and reasonably priced selection of stone beads. 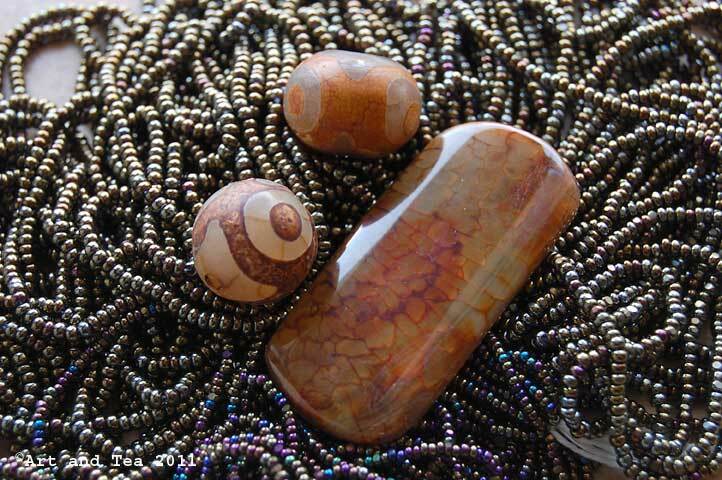 However, I find that one of the drawbacks about buying stone there as opposed to my experience at bead shows is that their sales staff is not always that knowledgeable about the names of the stones and not all of the bead strands are labeled. I like to know exactly what it is that I’m spending my money on, don’t you? 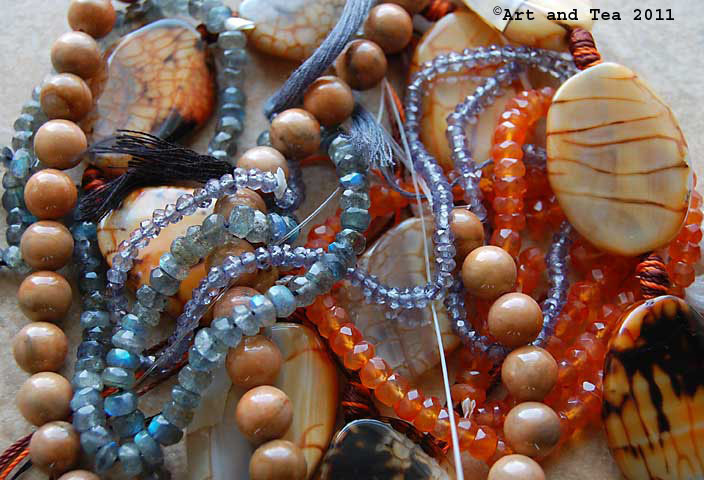 This time I was drawn to fire agate, carnelian, labradorite and iolite – a gorgeous sunset color combination. 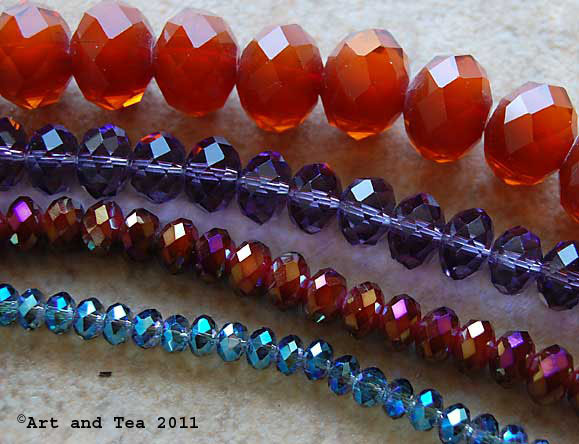 The photo above just doesn’t do justice to the amazing cinnamon color of the big crystal beads on top. They’re such a yummy, spicy fall color. 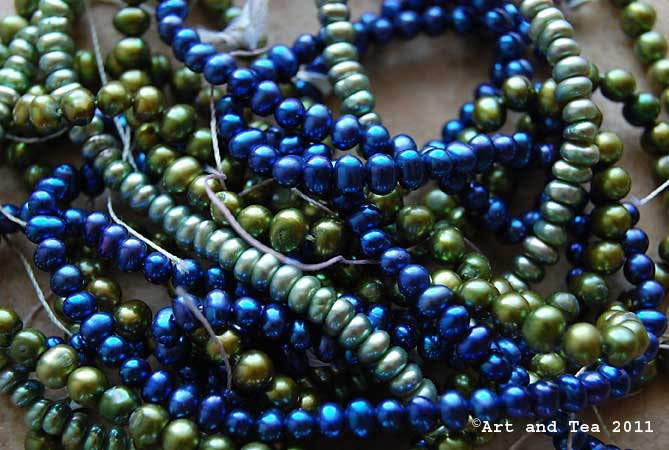 I’ve recently purchased Sherry Serafini’s new book called Sensational Bead Embroidery and am feeling inspired to create a bead embroidery piece using small pearls in the vivid blues and greens above. My absolute favorite bead store is Bead Haven in Frankenmuth, a quaint little Bavarian style village my parents love to visit for their homestyle chicken dinners. I was delighted that the restaurant, called Zehnder’s, had a vegetarian section on their menu. That said, their specialty always has been and will continue to be their “Thanksgiving-like” spreads. 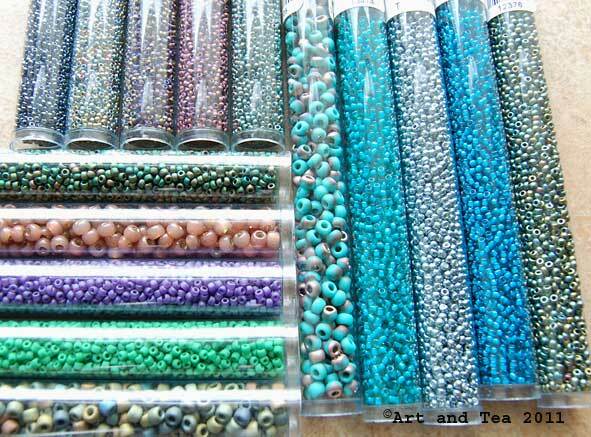 I have one main reason for visiting Bead Haven and that is for their amazing selection of seed beads. Wall upon wall of every size and color imaginable along with a whole wall dedicated to hanks of charlottes and “faceted” seed beads, my new love as you can see from my pictures. 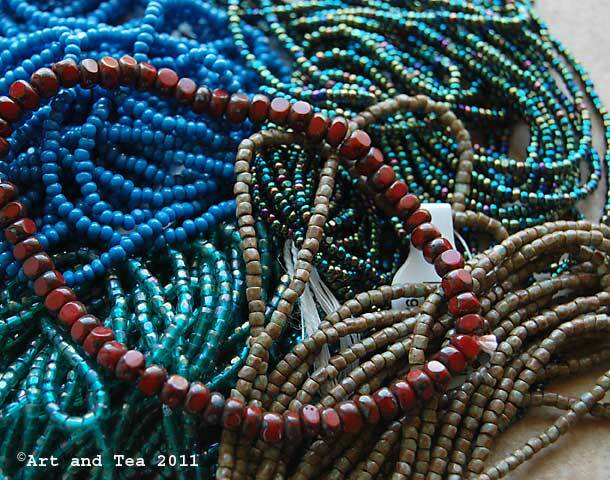 While their selection of seed beads is unparalleled, I find their stone bead pricing to be very high. Munro’s and/or a bead show is much more reasonable. Other than checking out, I didn’t have much contact with their sales staff since I was on my seed bead mission and didn’t require any assistance with that. My daughter, however, had an interesting experience when she purchased a “Pandora” style bead for her bracelet, which she was wearing, and then discovered that it didn’t fit. They were very agreeable about exchanging it for another bead though. In contrast to Munro’s, the sales staff at Bead Haven was all quite young. 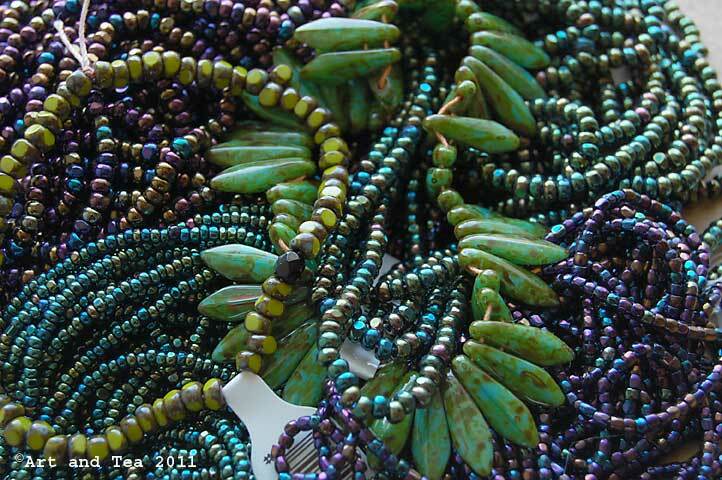 There are 2 bead shows in town this weekend, the InterGem show and the Innovative Beads Expo, both in Marlboro, MA. At this time, however, my pocketbook is telling me that I have enough to play with! I’ve been fascinated with wire for as long as I can remember. I love its versatility and strength for jewelry making. You can bend it into shapes, use it for connections and wrap it around beads. And it’s such an accessible form of metal, requiring only a few simple hand tools to manipulate into a beautiful creation. When I was visiting my son and his family in Albuquerque last November, we visited a LBS, Mama’s Minerals. It was a good thing that Brendan was with me or I would have become lost in the vortex of bead lust, putting myself into extreme debt and not being able to close my suitcase! If you’re ever in Albuquerque in search of beads, I recommend a stop at this amazing store. Anyway, we had decided to create a bracelet for my SIL for Christmas and it was up to Bren to choose the beads. I love his choice, don’t you? 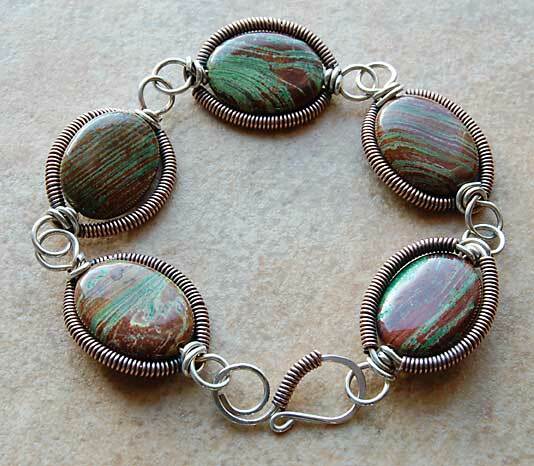 Before he started his quest, I gently suggested beads that had a southwest feel to them and these Saturn jasper beads he chose, in bands of turquoise and brown, are just perfect. 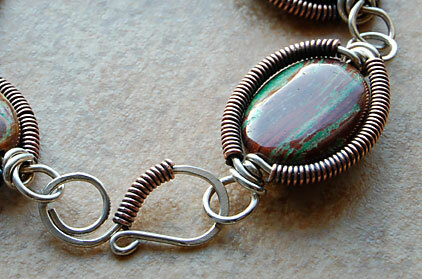 I love the look of the antiqued, coiled wire against the striking banding in the stone. Shortly after I came home, I picked up Kerry Bogert’s book, Totally Twisted: Innovative Wirework & Art Glass Jewelry, at the library and became enchanted with Kerry’s colorful wire designs. I chose the project on page 88, “Framed”, for the bracelet. You can’t really tell from the photos but the wire coils are made from copper wire and the wire wraps on the beads, as well as the clasp, are made from sterling silver wire. I love the look of mixed metals and silver and copper are my favorites. This was a great project to hone my wireworking skills, especially for wire coiling. I used a tiny double pointed knitting needle for that job. I love this design so much that I think I’m going to make a bracelet for myself now! 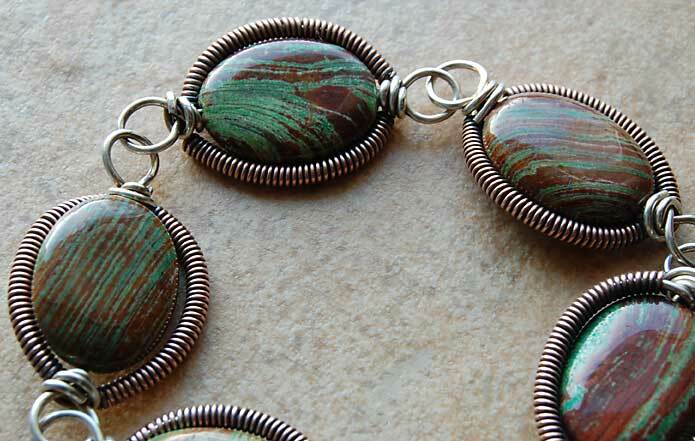 I have the beads picked out already – round coins of earthy Owyhee jasper. 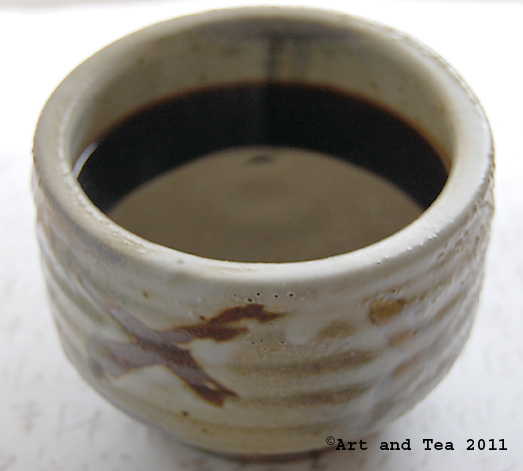 This is a great description I came across recently – “soft earthy colors of clay, teal, sage, brick, sand, umber with brush strokes of bark brown”. Wow. It’s a beautiful picture jasper, mined in southern Idaho/eastern Oregon. When I was a kid, I owned a well thumbed, dog-eared copy of a pocket-sized rocks and minerals book. I used to pour over that book for hours…I just love rocks. 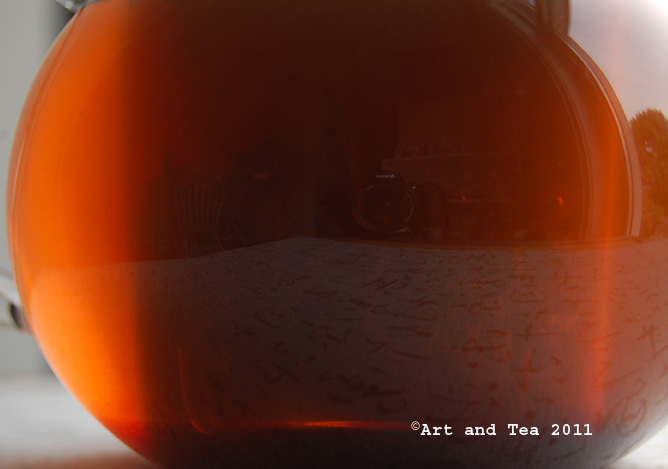 My morning tea is waking me up with its bold taste and refreshing pungency! 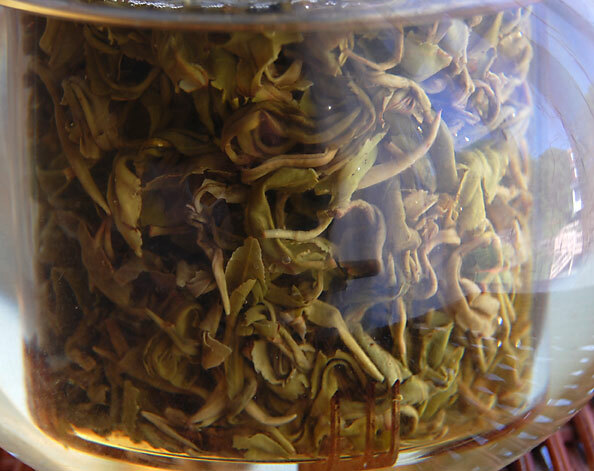 From the area of Qianjiang located in Hubei Province, China, it has been processed as a gunpowder green tea. 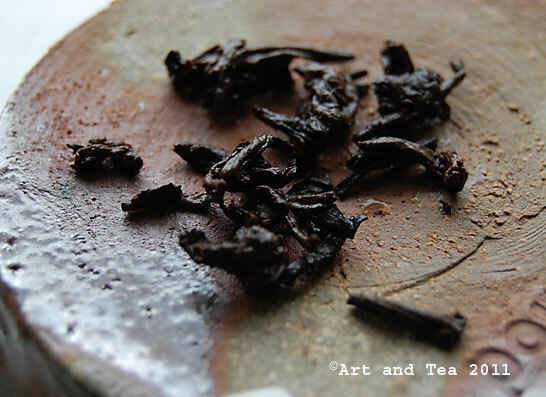 Gunpowder tea leaves are withered, and then steamed before being rolled into small pellet shapes said to resemble black gunpowder grains. Black gunpowder was invented in China during the Jin Dynasty (1115-1234) for weapons based technology to defend the northern border of China against the invading Mongols. 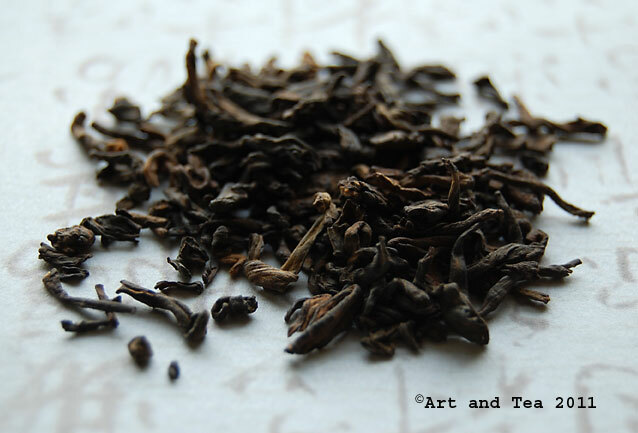 Most gunpowder teas nowadays are rolled by machine but some high grade leaf is still rolled by hand. 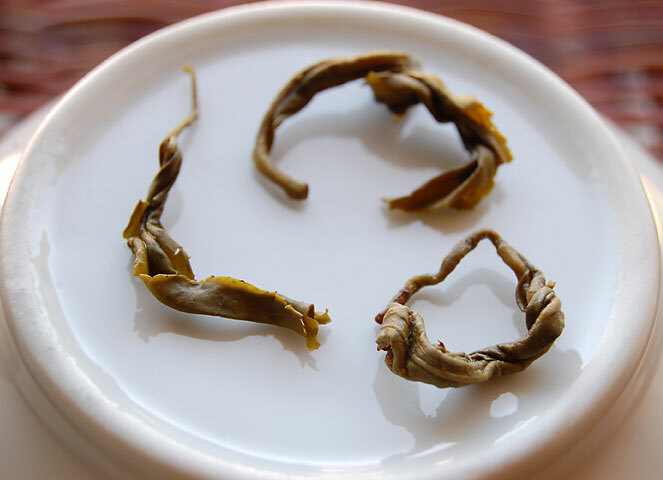 The beautifully intact leaf unfurls into circular shapes during its 3 minute steeping in 180 degree F water. 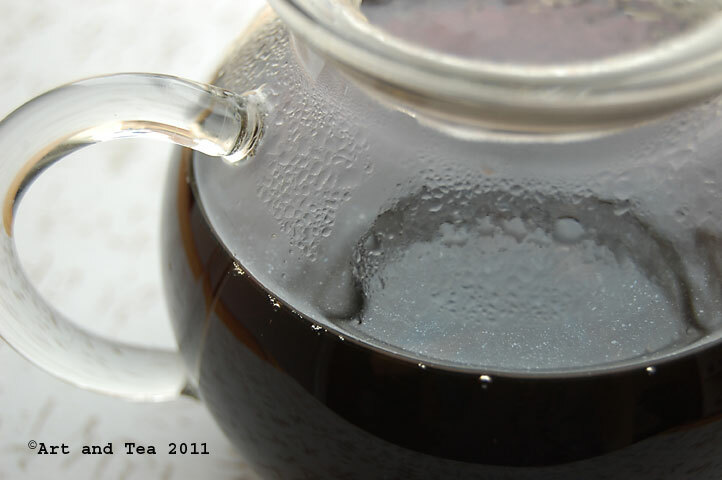 As I pour my first cup, a nutty aroma fills my senses. 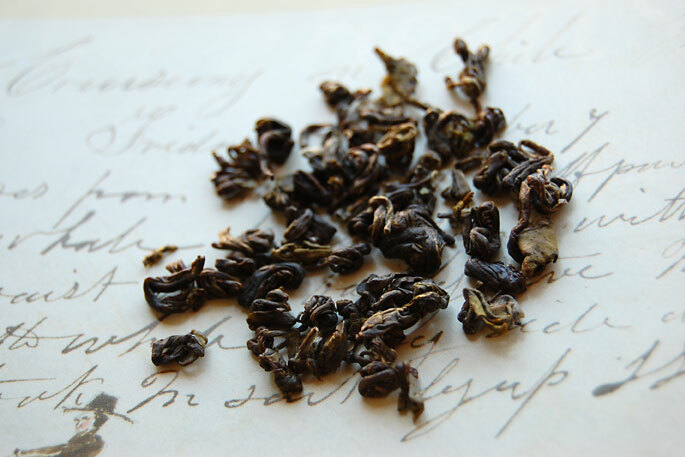 It carries on into the flavor of the pale gold liquor, also revealing a sweet fruit note and whisper of smoke. 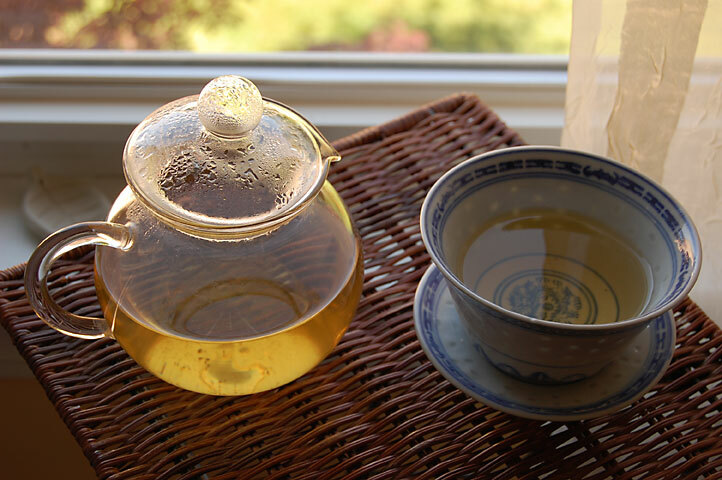 This is the perfect tea for those looking for more body and less vegetal flavor in their green tea. I had a wonderful visit with my parents, as always, way too short and then they are gone. We made our annual trek to Nantucket Island for a lovely 3-day getaway. You can read about last year’s trip here. The weather was sunny and cool, perfect for strolling along the cobblestone streets and embarking on another deep sea fishing journey. This time I stayed on land and cheered the returning fishermen on their bluefish catch. 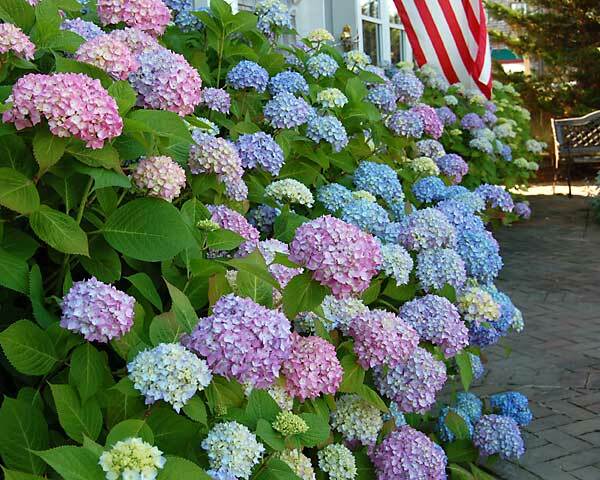 I drank in the sights and sounds of the island and the profusion of gorgeous flowers everywhere. I leave you with one of my favorite island sights. The last day. So final. This is the day that you find yourself trying to fit in everything that you wanted to do but didn’t get a chance to on all of the other days. So, it turned into a “bits” day – a little bit of this and a little bit of that. A little bit of walking around the grounds, poking in and out of all of the wonderful nooks and crannies of Mabel’s house. Here’s the door to that fabulous doorway. A little bit more shopping. There’s Dad relaxing while we buy more yarn at Weaving Southwest. A nice scenic drive for a little bit of picture taking. I sure will miss this wild, beautiful land. You might have noticed that I haven’t posted any photos of my shrug yet. Weeeelllll…it is almost done with just the sleeve seams to be sewn and the little yarn ends to be woven. Stay tuned for the “ta-da” moment of my Taos Shrug! It is not a country of light on things. It is a country of things in light. On the 3rd day of our Taos journey, we took a trip south to visit the capital of New Mexico, Santa Fe, for the afternoon. For me, the highlight of our visit there was a trip to the Georgia O’Keefe Museum. From the moment when I first gazed upon the closeup world of her lush, painted flowers, I have felt an answering resonance from within my heart and soul. It started my love affair with closeup photography over 20 years ago. To actually have the opportunity to stand before her paintings, in the one place in the world that housed the greatest number of them, was like heaven on earth for me. But, then again, it was New Mexico, and I felt a little bit closer to heaven there. There was a Fiesta going on in the main plaza that day. We threaded our way through the great throng of celebration to come upon a small French pastry shop, a welcome respite from the crowded plaza. A tart raspberry crepe with real whipped cream and a steaming cup of dark hot cocoa refreshed and revived me. After that wonderful treat, we made our way over to the Cathedral Basilica of St. Francis of Assisi, a 122 year old church built around an older adobe church originally constructed in 1610. You can read more of its history here. Sadly, the spires were never completed due to lack of funding. This beautiful statue of a native woman adorned with turquoise jewelry stands in front of the church. While the church itself is lovely and impressive, I was drawn more to the exquisitely carved front doors. And the labyrinth located in the forecourt. As my Dad and I walked the labyrinth, I could feel its calming energy radiate up from its path of well worn stone. You can read more about labyrinths and, specifically, New Mexico labyrinths here. We got caught in a rainstorm as we wove our way through the mountains back to Taos. Good thing we already knew the way. I find that if I get lost while traveling to a place for the first time then I will know the way back as if I have lived there always. Does the same thing happen to you? We ended our day at a warm and cozy (after the teeming rain) local landmark called Michael’s Kitchen. It reminded me of an old fashioned diner, a place where the locals go to hang out and eat a delicious homestyle meal. While I usually find that a place like this doesn’t offer many vegetarian options, I was absolutely delighted with their homemade garden burger. Perhaps the rainbow that guided us out of Albuquerque and along the road to Taos was more than just a good omen for our stay there. I believe my future was being revealed to me. I just found out recently that one of my color heroes, Lindly Haunani, will be giving a workshop in CT, facilitated by the Southern Connecticut Polymer Clay Guild. It’s called…………….. “Dancing with the Rainbow”. Lindly has recently co-authored a book with Maggie Maggio, another one of my color heroes. Dripping with page upon page of color eye candy, it is also filled with color exercises designed to help you find your own color voice. I devoured its pages as I winged my way to New Mexico, determined to start the exercises upon my return. 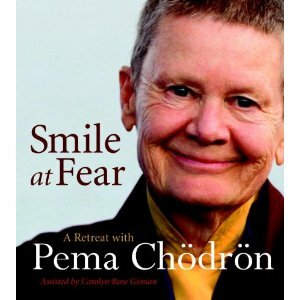 Now I find myself looking forward to studying with the master herself and I will savor every moment.